The table below highlights the academic performance of the high schools in the Ohio Appalachian Collaborative. Included with the table are links that provide even greater insight and detail. The table below uses the March 2013-2014 data from the Ohio Graduation Test for only the 10th graders who took the test. For those unfamiliar with the Ohio Graduation Test, there are five parts -- Reading, Mathematics, Writing, Science, and Social Studies. There is also a summary page that shows the percentage of students who successfully passed all five parts with a “Proficient” rating. The data used in this report is from those five parts and the summary. There were 996 schools included in the rankings of public and private schools. The Ohio Department of Education (ODE) Local Report Card data download capability was used to acquire most of the data for the public schools. The ODE provided electronic media as the source for the private school data, the charter schools, and the "percentage of students who passed all five parts" of the test for all schools. To create the statewide rankings, the Performance Index Scores were calculated for each individual subject. The schools' subject Performance Index Scores were then sorted. The table below is sorted so that schools are in Performance Index Scores order. While the table above provides a good, static comparison among these schools, it does not provide readers with an "over time" perspective. 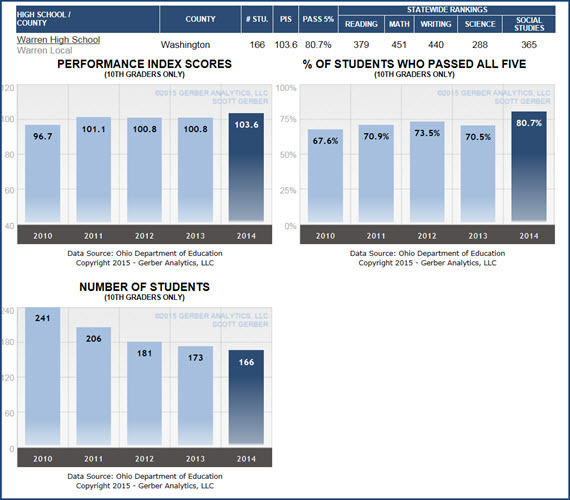 Click on this link to see five year trend charts for each school's Performance Index Score, % Who Passed All Five Tests, and Number of Students who took the test. Click on this link to return to the table-only view. Warren has done a great job in Science. What can it do better in Reading, Writing, Math, and Social Studies? Why is Waterford so strong in Reading and Writing? One of the goals for this web site is to encourage communities to become better informed and to ask questions. These tools encourage this.